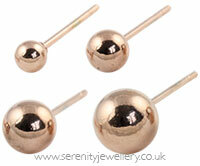 Hypoallergenic rose gold PVD coated 316L surgical steel ball stud earrings with matching butterfly backs. 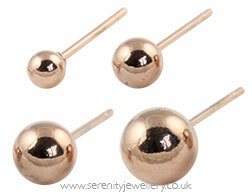 Please note: The 2mm and 4mm ball size look a more yellow shade of rose gold than the other sizes. Rose gold PVD coated surgical steel looks like rose gold in colour only. If you are allergic to rose gold it is a great alternative. Looks great and wears well. always get my daughters earrings from serenity as she cant wear gold or silver,and i find the hypoallergenic ones suit her better. It's so quick and easy to order earrings from Serenity and my latest pair are lovely quality at such a good price. I got them to match a rose gold watch. Quick delivery too. Sunday, 4 February 2018 | M.
My earlobes have become more sensitive over the years and I couldn't find a product that wouldn't irritate my earlobes and cause inflammation and pain. 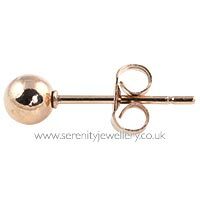 Have purchased a few earrings from Serenity Jewellery for my daughter, but have never tried any for myself. Decided to try the rose gold PVD steel ball stud earrings and am very happy with them. Elegant, simple and do not irritate my earlobes at all. Lovely earrings , look nice very pleased with colour too. Wish she could wear them! Bought these for my 9 year old daughter who is allergic to 9ct gold and silver. Unfortunately these were no good for her either. Absolutely nothing wrong with the ear rings, in fact I'll be wearing them myself instead. Have just ordered a pair of titanium ones and hoping these will be ok. Very pretty earrings. The rose gold is slightly more pink than appears on my screen, but was just the colour my daughter and I hoped it would be. My daughter has worn them almost continuously since receiving them and found them to be very comfortable - no allergy issues. Also excellent value for money. 316L surgical steel is hypoallergenic but does contain a small amount of nickel. The nickel release rate is only around 0.02μg/cm2/week (without the PVD coating) but it may cause a problem if you are very sensitive to nickel. Rose gold PVD surgical steel has a coating of Zirconium Nitride (ZrN) applied using physical vapour deposition (PVD) to create a hypoallergenic, long-lasting rose gold colour without using any actual rose gold.